SACRAMENTO – Now, President Donald Trump and Sacramento Sheriff Scott Jones have more in common – both have been sued for blocking critics from their social media pages, an alleged violation of the constitutional rights of those critics. Earlier this week, Sacramento Black Lives Matter organizers Tanya Faison and Sonia Lewis sued Jones in federal court for civil rights violations – namely, blocking them from his social media pages because Jones apparently didn’t like what they said. Trump was sued last year when he blocked users from his infamous Twitter page. A New York federal court ruled those were First Amendment violations, and in January the 4th Circuit Court of Appeals found that the “interactive component” of an elected official’s page is, in effect, a public forum and people can’t be blocked because of their political point of view. According to the Faison, the “censoring started after the Sacramento County Inspector General published a report criticizing sheriff’s deputies who killed Mikel McIntyre. While unarmed, he was shot to death on the shoulder of Highway 50. One of Jones’ deputies fired 18 shots across the road as McIntyre was running away,” she said. “Sheriff Jones responded by refusing to allow any further investigation and he locked the Inspector General out of buildings. The lockout was reported in the media and was discussed by the Board of Supervisors. When I commented on that post, he deleted my comments. Then he banned me from his page. I am still blocked. This is oppressive,” she said. “The internet is an important place for the Black Lives Matter movement. We use it to share our messages, spread important news, and amplify calls for racial justice. Facebook is one of the only places we can engage with the sheriff and his supporters. Expressing our views is a part of our role as residents of Sacramento,” said Faison. 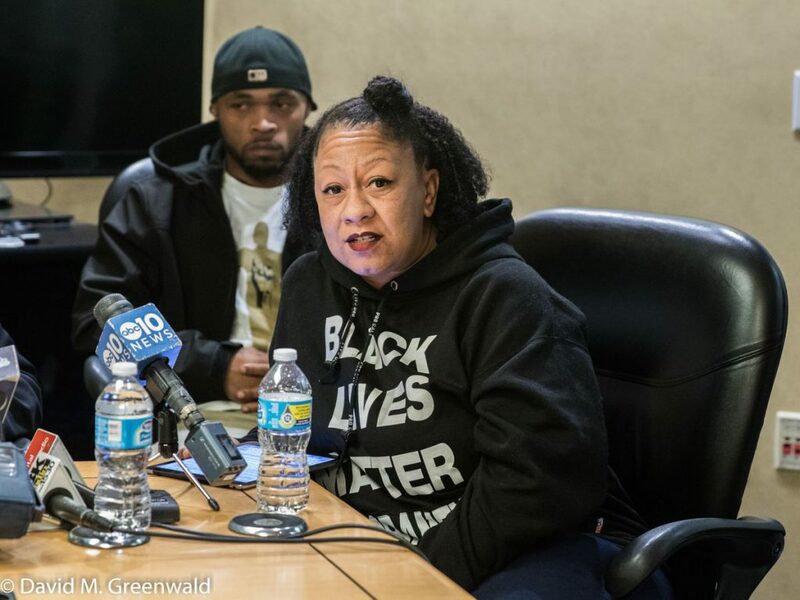 “We feel compelled to call public attention to state violence and racist policing. Whether or not the sheriff likes our message, we must have the ability to hold his office accountable. He relies on Facebook to communicate with the public; he doesn’t get to pick which constituents he wants to engage and block the rest. He’s using unfair tactics to try to silence us and shut down our movement,” she said. There’s been bad blood between Black Lives Matter and the sheriff (and other local law enforcement) for years, especially the last year since unarmed Stephon Clark was shot and killed by Sacramento City Police. Sheriff choppers played a part in the killing. And at a protest later, sheriff’s department deputies ran over a protestor on Florin Road, and Jones – who seldom if ever releases video footage – made a point to single out “paid” protestors and attempt to show his deputies did nothing wrong. However, the footage went national and international, embarrassing the department. It asks the court to order Jones to “unban” the two activists. Interestingly, the filing only asks only nominal damages of one dollar each, but also awarding the activists punitive damages and reasonable attorney fees and costs. Surprised no comments here – downside of the new Vanguard policy. This is an interesting emerging area of law – can a government official deny access to a private page he is using for communication. The courts are leaning toward a no here. More than a lean. Damages awarded.